Not really a Fusion feature, but more interaction from the devs/product team with the community. It's always nice to have conversations and discussions with the teams behind the tools we use, and even if we can't get hard dates for what's going on or the exact future of a product it can help allay confusion or negative speculation. I realize that BMD is more of a private/conservative company when it comes to news, but they are the only one out of the several tools that I use that don't offer any form of hard insight as to what's coming outside of snipped sentences at conventions where questions can't be avoided. I think part of the concern comes from BMD not releasing products when indicated. I’m hoping the new BMD pocket cinema camera 4K is coming out in September as promised. Personally, I’m very interested in getting one. I hope BMD releases it’s own videos demonstrating this new camera ahead of its release date. So the question is - I think - will you pay for the effort of 3rd parties who invest serious time (and thus money) into providing what you ask for? i.e. will you pay for plug-ins/custom macros/fuses/interesting set-ups? Yup, that was my question. Because it certainly is serious time and effort. Would pay for Deep support. +1 Mike! Michael, your post may be historic. +10, Would pay for Deep support. Assuming Fusion Stand-alone will still exist. Theodor Groeneboom wrote: +10, Would pay for Deep support. I think it would be a big mistake if BMD discontinued Fusion standalone. There are plenty of companies that depend on Fusion standalone for their work. To kill that would be the first nail in the coffin. I guess anything is possible. But, I would be surprised if BMD killed off Fusion as a standalone. You can only make a program only so user-friendly. When you want a powerful program, logic would tell you that there will most likely be a learning curve to picking up and utilizing the power. That is is very true I totally agree I never said things should just build itself with a push of a button and actually I never spoke about myself I said that I find fusion not really hard I like how it deals with things but some people do and it is important to find the problem weather it is a lack of learning material or an actual user experience problem, that can benefit both the user and the company, again not that I am facing that problem or complaining about anything and actually I am willing to become a part of the solution not the problem I am thinking about starting a youtube chunnel to teach the new users how to overcome problems and explain the tools that I learned so far. I am using the tools manual to learn but in the end of the day the manual can take you so far as it is most of the time more about the technique not the tool itself but still it is very handy . If you want dramatic results, expect to put time into learning a program and understanding its tools to achieve those results. When you've put time into a project and you get results that make you happy, chances are you will look back and appreciate all the time you put into that project. And you will realize it was all worth that time and effort. True and false, well yes some effects require the user to dig deep and experience a lot BUT some other effects are not possible without upgrading some old tools or creating new tools,for example I am trying to create a system that can approximate GI for interior renders well I divided GI into several effects or better said several problems that should be solved to achieve a believable effect that should look like raytraced GI but not as acurate so it should just trick the eye into thinking that it is a real GI. In this project I was able to create an Area light that can produce similar shadows to raytraced light ,that was the first step the second step was to fake the light bounce I was able to get a very basic version of a solution that can lead to something if only the tools weren't so limited ,it is still possible to do the effect manualy but not possible to automate it with a system and that is so time consuming that it is not worth it anymore ,so to solve a problem like this I guess videos and documentations are not very useful anymore it needs a tool to help achieving it.The third problem is light bleed I didn't deal with it yet because I am still trying to solve the second problem. If you have any thoughts about how to achieve it I would love to hear it. I don't think you can beat video tutorials in their means of teaching techniques and the use of tools to new and veteran users of programs like Fusion. Yes, manuals are limited in their use when it comes down to actually working with a program. It sounds like you're asking for more powerful tools that are easier to use without the guidance of videos and manuals. I have to disagree. I thinking getting the most out of a program requires a combination of learning through experience and learning through tutorials and other user's experiences and techniques. Sometimes, you have to find solutions with the current state of any program and their tools. No program exists today that has everything you need that doesn't require time to understand through personal use. My biggest pet peeve with developers is that many times too often they rely on third parties to create tutorials for their products. Who better to create tutorials than the developer themselves? Although there are cases where some third parties are certified teachers of the program in question. In those instances, I think it's perfectly fine for developers to turn to such people to create content for them. In the end, until new tools are added to a program, you have to learn about what solutions that program offers today. Your best bet, is to maintain communication with developers so that they can see for themselves what users want most of their software. Until then, work with what you've got. Anyway, please fix the existing bugs. I want 9.0.3 rather than 10. Todd Groves wrote: Who better to create tutorials than the developer themselves? Just about anybody really, at least in most cases. Developers tend to be really bad users of their software. Which is not surprising given that their focus is quite different. Obviously there's exceptions to that rule, but if you're knee deep in code, you rarely think about how the tool you're writing can be used outside of the original use case. And the knowledge of how to use the application rarely goes beyond being able to test it and replicate issues reported by customers. The developers did create documentation that BMD removed. The help system hasn't always been this anemic. Chad Capeland wrote: The developers did create documentation that BMD removed. The help system hasn't always been this anemic. That's too bad. BMD needs to ramp up their tutorials and support for Resolve 15, Fusion 10 (when it comes out), and their new BMPPC4K. What do you mean? Resolve has the XRite match panel. Along with other color swatch types. Ah, but we want one that actually works. Did you get funky results when you used it? Yeah. It's non-deterministic. It's also a black box. And it doesn't work. Otherwise, though, it's cool. Agree - but to do that, I have to buy Resolve, right? At least install it (if there is a kind of free version). I believe that all of you guys agree, that the main goal of Fusion is a compositing, add some 3D stuff into the raw video - make it live there, be a part of it, seamless. And the main goal of the Resolve - is to grade the colors, work with a bunch of shots, add some mood with a colors, accents, within huge timelines. Just completely different scale of work. I wish to have an ability to put into the raw some VFX with the right colors while working one single software. And let the grade department do their work with their tasks - grade whole shot real one + CG which is already in a same colors, gamma, so on. Do not mix. I shouldn't jump to the one more software and play with an another department's massive toys. That sounds more like personal preference. I think including Fusion inside Resolve is a brilliant solution. It makes project management easier and creates a more stable environment where all artists on a project can make changes faster. I think the interface of Resolve with Fusion is a well designed one. I personally love the interface and workflow of Resolve. Hopefully, the version of Fusion within Resolve will match the standalone version at some point, if it doesn't already. And given the power and stability of most computers these days, such an integration is more seamless than ever. Todd Groves wrote: Hopefully, the version of Fusion within Resolve will match the standalone version at some point, if it doesn't already. It won't, and there's really no incentive for it to, either. What I'm curious about is why Resolve isn't being built into Fusion. At least the color panel. Chad Capeland wrote: What I'm curious about is why Resolve isn't being built into Fusion. At least the color panel. That's a good question. Did you ever formally ask this question in the Resolve beta forum, I can't recall. MVP could be a window that contains the Color page and all interaction would happen there, not unlike Neat Video. Do you mean that you'd want only the Color panel from Resolve inside the standalone of Fusion? If the final version of Resolve 15 has a full version of Fusion inside, why would they add anything to Fusion standalone? It won't. It will have a partial implementation that will run slower. And it will be crippled by Resolve's project management and prescriptive workflow. Have you tried the Resolve beta? Yes, I've used each beta release on real world projects without any issues. Although I haven't put much time into the integrated version of Fusion, yet. But, I've seen a lot of tutorials of Fusion within Resolve that seem to work well. Some parts work, yes, but the philosophy is that it should be used in certain use cases and it fits that mold fine. The other use cases don't matter and you'd be unable to do in Resolve. But that same philosophy would underpin an implementation of Resolve's Color panel into Fusion. You likely wouldn't grade a feature film in Fusion even if you had such a tool, but you wouldn't do feature film compositing in Resolve either. But having additional tools for certain use cases can be helpful. Actually I would do feature film work in Resolve using Fusion. As long as it’s stable there’s no reason not to. As soon as Resolve 15 goes to the final release, I’ll be doing all kinds of things to push it to see what limitations it may have. If it’s stable, then I’ll be happy. Maybe large studios won’t composite in Resolve 15, but that will most likely be because they have established workflows with a set of tools already in place. For independent film makers like myself, I’ll be more than happy to do most of my work in Resolve. If this is a general wish list can we consider vector tracking as seen in Nuke and flame for v10 ? Tanvir Hanif wrote: If this is a general wish list can we consider vector tracking as seen in Nuke and flame for v10 ? What is vector tracking used for? I’m not familiar with the term. 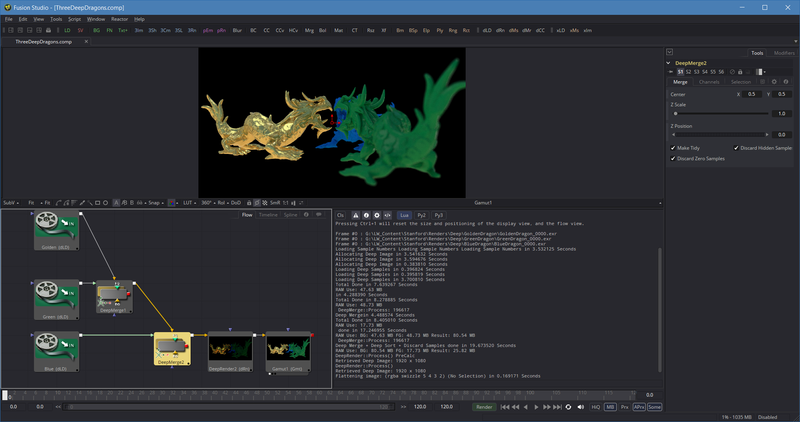 Nuke call it "smart paint"
Bolstered stability of the bSpline tool and/or any other stability related issues (I've experienced a lot of crashing with the bSpline tool in Fusion 9). Not so much of a feature as a fix request, but still very important if we are talking about Fusion 10 requests. That's why we need this tool right inside Fusion, because in DaVinci it's no go for VFX shots. I just realized one more thing which is really cool to have in F10. Recently i found out one (a very weird as to me) option to scale with a Ctrl+M.Scroll the small panel under the views, the panel with an A, A/B, B buttons and so on. I was surprised that it's possible to adjust the size of it so smooth. Not just 100% and 200% as fusion has in the preferences. 100% - is too small for me within 1440 27" screen, and 200% is crazy big. So, it would be awesome to have option in a same way Ctrl+M.Scroll to scale up/down all panels in the fusion. ThomasManz wrote: - Connecting nodes is very fiddly. making the connectors larger or ideally like in nuke drop them entirely and just connect with arrows or so. This gives a lot cleaner Flowgraph. Like Todd Groves already mentioned, Fusions Flowgraph isn't particularly pretty, even with his requested (and found) dot-connectors..
Also, it's great the community has grown this much, but a lot of the feature requests or missing Nuke features I see here can simply be solved with something as simple as RTFM or LMGTFY. That's not to say Fusion can improve in a LOT of areas though. Yes, a lot of information can be found in the manual. Sadly, the manual doesn't always make clear how the tools can work together. That's where tutorials come in. Some manuals come with a few tutorials, but, they usually focus on the basics. Which is fine. But, I mostly gain my understanding of how to use a program through tutorials. By watching someone else work within the program, all the tool names and techniques start to make sense. Additionally, I can look up a tool in the manual and find out what that tool does. But, how it can be applied within a project isn't always clear. Again, back to tutorials. And that's why it's important to have a vibrant community of users. So, we can all share our experiences and techniques together. A multi-channel spruce up (tools à la Shuffle, ShuffleCopy, etc) would be absolutely brill. I'm only just dipping my toes into Fusion at the minute, and it's almost all good so far, but I find the smooshing around of EXRs slightly clunky. I did a quick search within this topic and couldn't find it being mentioned. But, I would love a node where you can create multiple roto/polygon shapes in one node. Instead of using a single node for every poly shape. Nuke has this in their Paint and Roto nodes. I would love to see something like it in Fusion. Todd Groves wrote: I did a quick search within this topic and couldn't find it being mentioned. In Fusion 4 and earlier all the masks were in one node, F5 they broke it out to multiple nodes this has many benefits like reusability, easier to organize/overview and follows the philosophy of more granular tools . If you do want; you can collapse the node/roto tree into a group to organize your flow in Fusion. Also, the Paint node lets you draw rotoshapes and can host multiple splines. I actually really hate Nuke's RotoPaint node. One of the first things I do when sitting down with Nuke is rebind O to the old Roto node. But I know there are those who like it, so it would be nice option if the Paint and MaskPaint tools had an option for drawing closed splines and a Paint Mode control for combining the strokes. It's 80% of RotoPaint already. A couple more features in the Modifiers would take it the rest of the way. 3d Fuses: I've found myself stymied from time to time with a limitation in Fusion's 3D system that I know I could solve with a Fuse, but I don't have time to learn the SDK to make a plug-in. Last edited by Bryan Ray on Thu Jul 26, 2018 2:33 pm, edited 2 times in total. Is there a tutorial or walkthrough of using the Paint node for multiple shapes and splines? Motion warp tracking like Flame or Vectorwarp like Nuke. A must. tpolson wrote: Motion warp tracking like Flame or Vectorwarp like Nuke. A must. I'd love to see Smart Vectors like Nuke has in Fusion. Martin Raw wrote: I would love to see some lens effects, glows and blurs able to be a match for Frischluft/ReelSmart/Sapphire etc.